A good, solid day of writing. But I'm a bit worried now. As I've mentioned, I'm writing a mystery novel -- my first dive into that genre. I read a lot of mystery novels and know that this genre should be no less than 60,000 words. 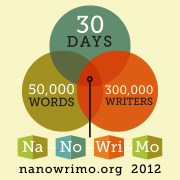 NaNoWriMo's goal is 50,000 in thirty days. I'm past the mid-way point in the novel and have realized that I may not have enough meat in my plot to get me past much more than 50,000 -- great for NaNoWriMo, bad for a mystery novel. I started to panic a little, questioning why I didn't think it out further before I jumped in. But worrying is a wasted emotion. I got it out of my system and decided to move forward. If by the time I'm done I have 40,000 words, so be it. That's the story that was produced. However, I have confidence in my characters. I have a feeling that they'll throw a couple of curve balls soon, extending the word count in a natural organic and meaningful way. But one thing is for sure, I will not add empty scenes, empty words, or empty subplots. A good story with escalating conflicts and deep characters generate words. Words do not create a good story. Even if you only get 40 or 50K for your first draft, there's always plenty of layering that can go in on the later passes. I tend to skimp on setting and then layer it back in (in small bits) to set the scene and keep the reader grounded. Plus it helps provide deeper POV if I can make it specific to the POV character for that scene (like what a cop would notice about a room compared to an interior designer). I also find that I have to ramp up the emotion during revision. Anyway, you're really killing it this year. Great job!